Nestled amid rolling hills, Sealey Wood is a select development from Edenstone Homes enjoying a picturesque setting with panoramic valley views. While the development features just 11 private sale properties, including two already reserved ‘off plan’, there are eight designs for buyers to choose from. The development also features five affordable homes. Viewing the new four-bedroom Barrington show home will give buyers the chance to appreciate the beauty of the location and the superb specification. 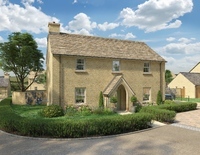 The Barrington is a beautifully appointed, double fronted substantial family home. Practical and stylish in equal measure, it features a drawing room on one side of the entrance hall and dining room to the other. To the rear, the combined kitchen, family room and breakfast area is essentially open plan in essence, with the kitchen to the side so that parents can cook while supervising little ones. French doors open from the family area to the rear garden, offering easy access to the outside space and lots of natural light into this sociable space. There’s also the practicality and convenience of a cloakroom and a utility to keep the washer and dryer out of the kitchen. Sealey Wood offers two/three-bedroom homes to substantial five-bedroom properties. Current prices are from £558,000 for a two/three-bedroom home. The specification includes Sigma 3 kitchens with fully integrated Neff appliances, plus contemporary sanitary ware from Roca and premium ceramic wall tiling from Porcelanosa in bathrooms and en-suites. Horsley Primary School, the community shop, Horsley Village Hall, playing pitches and pavilion, ‘3 in 1’ Church and bus stops are all within a mile of the development. The show home at Sealey Wood is open from May 12. For more information, see edenstonehomes.com/sealey-wood-horsley.